We Abrablast Equipment Private Limited commenced our operations in the year 2014 as a manufacturer, exporter, and trader of a commendable range of Industrial Machinery. Our admirable range made up of the finest Airless Standard Machines, Abrasive Blasting Media and Blast Cleaning & Finishing System, which is widely acclaimed and asked for in the market. For reasons of providing maximum satisfaction to our clients, we engage in the using of high-grade raw materials and modern machines, in accordance with the guidelines of the industry. Owing to this, the offered range’s performance and service life are widely praised. In addition to this, we provide the finest Blasting Machine Repair and Maintenance Services at the most reasonable rate possible. The state-of-the-art infrastructural facility at Abrablast, undergoes regular up-gradation, for reasons of boosting our presence in the market and maximizing our production capacity. The facility is parted into several highly operational units, for reasons of managing the firm’s operations in the most effective and efficient manner possible. In order to attain several of the firm’s predefined targets, the facility has been equipped with all machinery and equipment, needed. Along with this, our following of industry ethics, and guidelines have helped us generate a huge client base. Under the guidance of our Managing Director, Mr. Pankaj Rathore, we have managed to achieve commendable success. His managerial skills, ability to understand the market and make tough and precise decisions, have been nothing less than a boon to us. Our team of highly able and highly experienced professional, are recruited on the basis of their skills and willingness to work hard. The professionals, help us in the attainment of several of the firm’s predefined goals and targets. For reasons of managing their operations, in the most efficient and effective manner, the team has been parted into several highly operational units. Further, the team is trained on a highly regular basis, keeps the professionals updated with the changing market. The highly advanced state-of-the-art infrastructural facility at Abrablast is upgraded on a highly regular basis, for reasons of attaining smoother and effective management of the firm’s operations. The facility upgraded on a highly regular basis helps us in maximizing our reach in the market. Further, the facility has been laced with all the necessary machinery and equipment, which facilitates the attainment of several of the firm’s predefined goals and targets. To us at Abrablast, providing quality is something of high importance. Thus we engage in the utilization of high-grade raw materials and modern machines, in accordance with the set industry norms and guidelines. This ensures the product’s performance and longer service life. 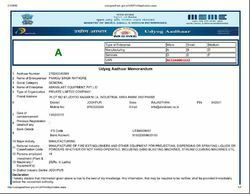 Further, the products are sent for several rounds of quality examinations, where all manufacturing defects are eliminated with the high level of precision. This allows us to provide a highly standardized range to our clients. We are widely known to be one of the leading manufacturers and traders of this commendable and wide range of Industrial Machinery. To maintain this reputation, we engage in the utilization of high-grade raw materials and modern machines, in accordance with the set industry norms and guidelines. This ensures the product’s performance and longer service life. In addition to this, the offered range is made available in the market at the most reasonable rate possible and is delivered in the timeliest manner. 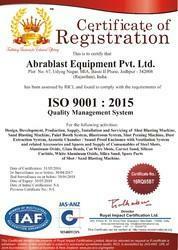 Our Company Abrablast Equipment Private Limited is "CE" Certified Company. 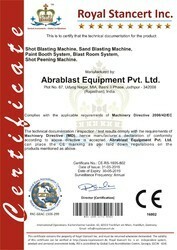 Our Company Abrablast Equipment Pvt. 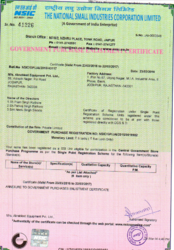 Ltd Is NSIC Certified Company.